View More In Bike Mirrors. Keep your eyes on the road in front of you and bike safer with the Race Icon bike helmet mirror. Biking on the road with cars can be dangerous and constantly looking over your shoulder takes your eyes off the road in front of you. Our FLAT mirror offers the best view vs a convex mirror. It has clearest view possible and allows you to judge distances better then a curved or convex mirror. - The Race Icon mirror weighs the same as 5 sheets of paper. 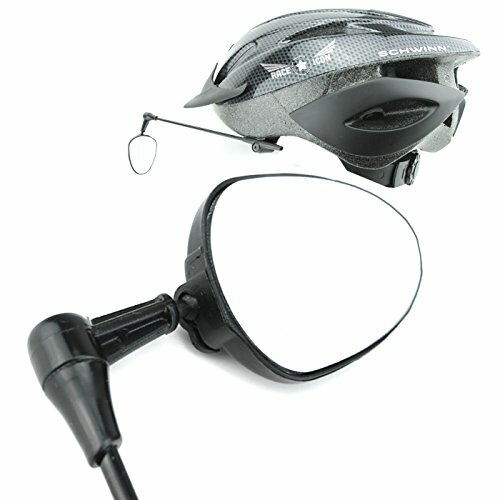 The Race Icon helmet mirror is simple to adjust and easy to lock in place. - Ability to lock in the adjustments so they won't vibrate loose during your ride. Why mount the mirror on your helmet vs handle bars? - Safer, you can simply look ahead and see the mirror in your peripheral vision, no need to look down. - Bike helmet mirrors have almost zero vibration compared to handle bar mirrors. Where do you mount the mirror? - The mirror typically mounts on the inside of your helmet and needs a 1 3/4" by 1" flat spot to mount. You can mount on the outside or in a vent on top of your helmet if you helmet has enough room. CLEAR VIEW FLAT MIRROR - We included a flat mirror so your view is very clear and not distorted which makes it's easy to view any distance behind you... similar to a car rearview mirror. LOCK IN THE PERFECT ADJUSTMENT - 360 adjustment plus the mirror is on a ball hinge and makes it super easy to get the perfect viewing angle no matter your preference. SUPER STRONG & BUILT TO LAST- Our feather weight mirror is made from strong polymer and aluminum for the perfect combination of strength and low weight. Weighs equivalent to 5 sheets of paper. RISK-FREE GUARANTEE! You will be 100% satisfied or we'll give you your money back. If you have any questions about this product by Race Icon, contact us by completing and submitting the form below. If you are looking for a specif part number, please include it with your message.